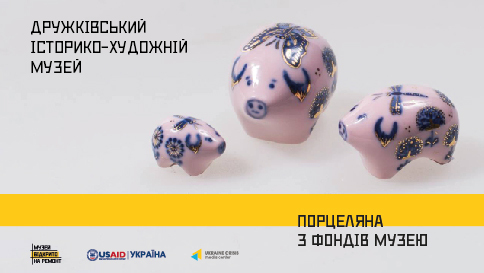 The mini-project “Porcelain from the museum storage” will be presented at the Druzhkivka history and fine arts museum (Engels str. 112) on February 16 at 12:00 in the framework of the project “Under construction: Museum open III” run by Ukraine Crisis Media Center with the support of the United States Agency for International Development (USAID). The project “Porcelain from the museum storage” promotes porcelain as an outstanding branch of Ukrainian art that originates from the folk traditions of pottery. During the event a catalogue will be presented showcasing the porcelain collection from the storage of the Druzhkivka history and fine arts museum. 2019 has been chosen the Year of the Druzhkivka-produced porcelain at the museum. In early 1970s existent tableware was no longer meeting the demand. To address the demand a porcelain factory was built in Druzhkivka, the first one in Donbas. The factory opened in 1971. Press contact: the museum: +38 095 3943467 and Olha Honchar, PR consultant at the “Under construction: Museum open” project: +38 093 339 76 46.